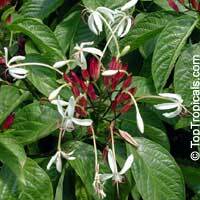 Fountain Clerodendrum - rare and hard to propagate plant. Fragrant flowers from spring to fall cover the dense beautiful shrub. Very fragrant. Winter Starburst, Fireworks. 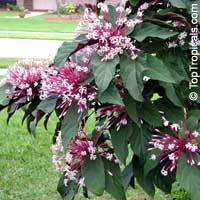 Large bush or small tree with showy dark green leaves with purple underneath; spectacular winter blooms. Flowers are slightly fragrant. Fast growing. Winter Starburst - variegated form. Beautiful small tree or bush. Very rare plant and is hard to propagate. 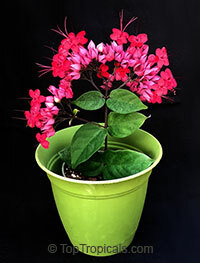 Cuttings root not as readily as common clerodendrums. It is a pretty cold hardy and strong plant inspite of variegation that usually makes plant less vigorous. 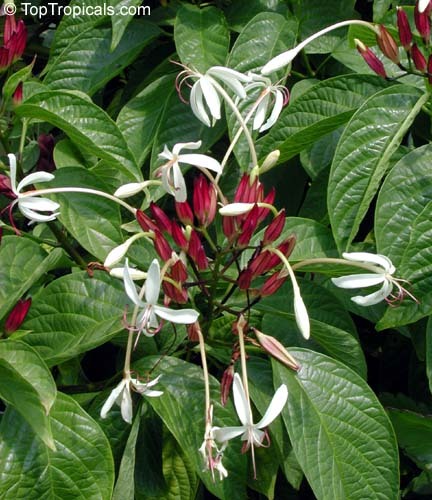 Champagne Clerodendrum - drooping fragrant flowers. Fast-growing multi-stem bush. Red Bleeding heart - a fast growing showy vine with bright pink-and-red flowers. Good for creating a privacy hedge or as over the fence cascade of flowers. Needs strong support, or a large trellis. 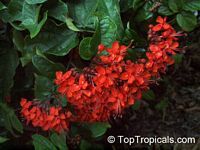 Flaming glorybower, Orange Bleeding heart - rare variety, Bright red (dark orange) flowers. Fast growing vigorous vine, very showy over the fence on on pagoda. Seagrape. Popular plant used as an ornamental in gardens or indoors, subjected to salty winds and drought. 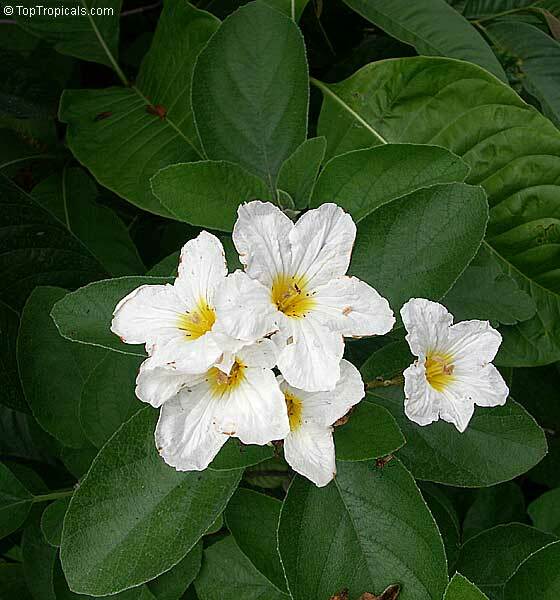 It has stiff, rounded platter-like leaves shading from yellowish to olive green with prominent veins. 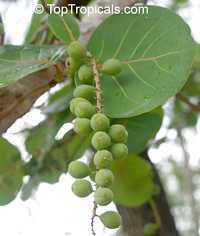 Long clusters of berry-like fruit which follow are striking and give the tree its popular name. Somewhat acid in taste, the fruit can be used to make jelly. Very easy to grow and undemanding plant. Very popular collectible hybrid, this is one plant that truly lives up to its cool name! Purple and green camouflaged leaves with a lime green stem. 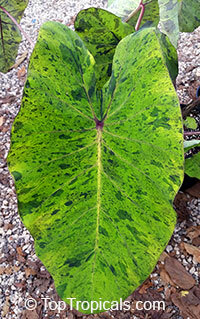 Each leaf of this Elephant Ear is like an artists canvas, no two are exactly alike. Splashed, splattered, sprayed, marbled, splotched - take your pick of adjectives to describe the unique pattern of lime green, chartreuse, purple, and near-black colors on each huge, arrow shaped leaf. Even its stout stems are colorful: light pink with dark rattlesnake-like stripes. The colors tend to be most vivid when sited in partial shade. 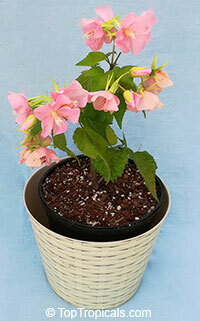 This plant will grow well in large containers or in the ground as long as consistent moisture is available. In the ground, the leaves can grow a whopping 2ft long by 18in wide and the plant can reach 6ft tall. This plant will also grow in shallow water. Large glossy green leaves are adorned with a wide band of creamy white down the center of each leaf. Veins are bright purple. 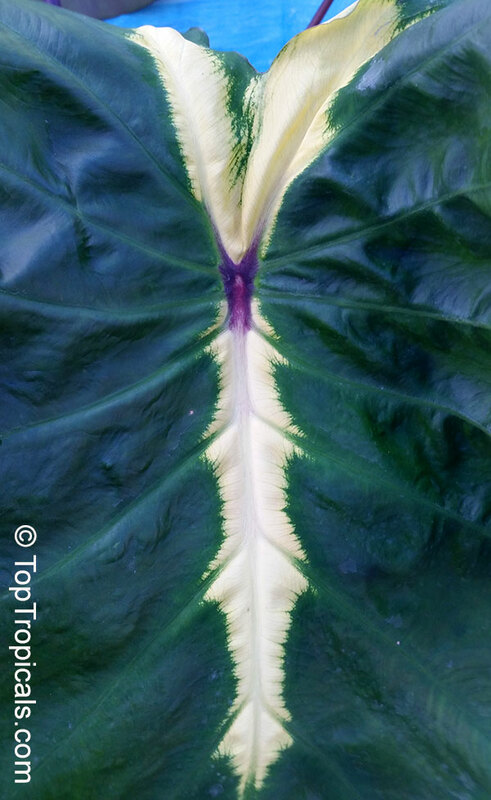 There is also a distinct purple spot in the heart of each leaf. Perfect for large containers, garden borders, or mass landscape plantings. The large, glossy green leaves develop a striking creamy-white band down the center of each leaf that radiates out into the side veins as the leaf matures creating a stunning specimen that is attractive and eye-catching. 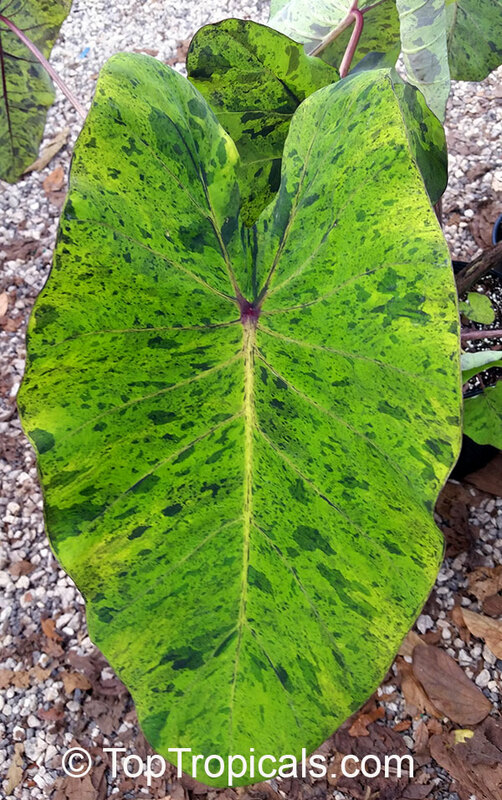 This new colocasia is a tightly clumping plant that’s ideal for a container or garden bed. Young plants come as green leaf, then start showing "white lava flow" as they develop. Shower Orchid, Wooly Congea. 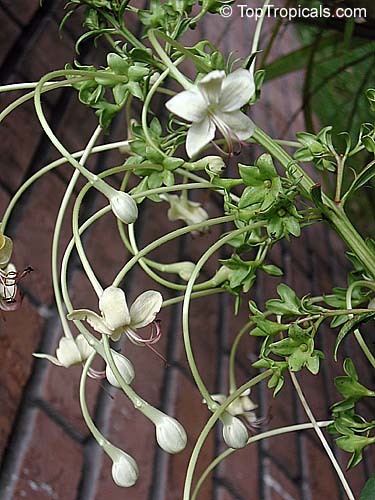 The actual flowers are tiny and inconspicuous, but they are borne in the center of three showy white 1in long bracts that look like velvety propellers. 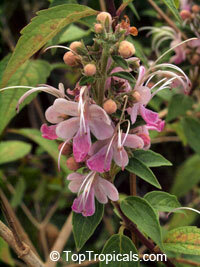 The bracts gradually change through pink, lavender, and finally gray over the course of several weeks. 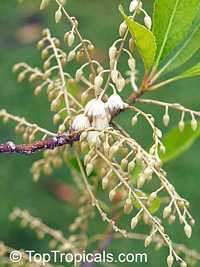 Cordia boissieri - White Geiger tree, Texas Olive, Anacahuita. Very popular small trees adorned through much of the spring and summer with large clusters of showy white flowers. Requires ample water to become established, after which it is generally considered quite water efficient. These plants don't like to be grown in pots, in spite of their small size, and usually don't look very happy in containers; however once planted in the ground,they grow faster and start thriving. Cold tolerant plant, takes some freeze. 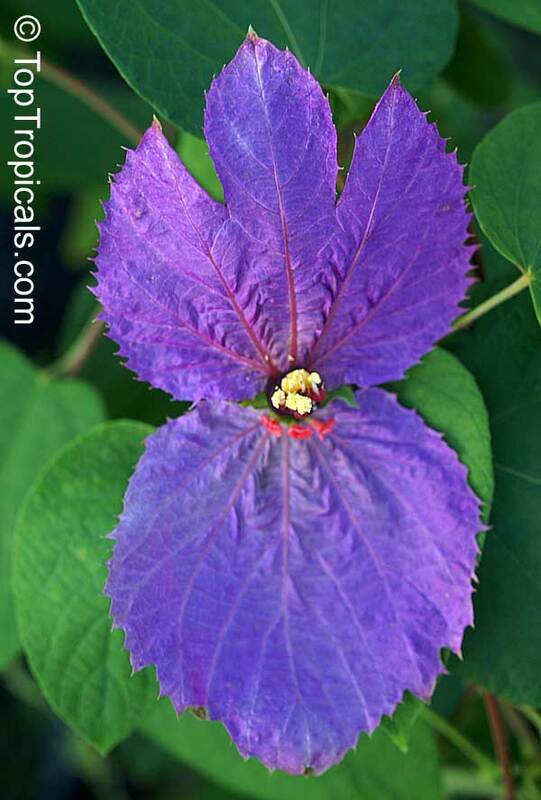 African lilac, Jamaican lilac - Fast growing shrub with astonishing fragrant velvet leaves. Tall stalks shoot out multiple lavender blue flowers. Both foliage and inflorescence makes an outstanding display. Attracts butterflies. Leaves have pleasant tobacco-like scent. Winged Beauty, Costa Rican Butterfly Vine. Spurge family is well known for the poinsettia and other showy euphorbias, but not for its unusual vines. This is one which seems to enchant anyone who sees it. 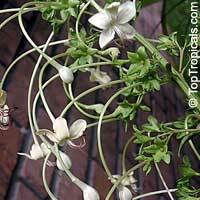 The most dramatic feature is the flowering shoots. 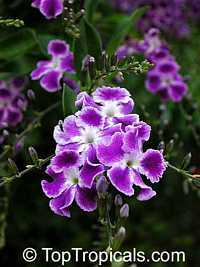 Each has a pair of broad, pointed, reddish purple bracts, 2-3 inches long, widely spreading above and below the clustered small, whitish flowers. Outstanding sized bracts with an eye-catching show of color characterize this vigorous growing vine. Flowers year-round with its heaviest bloom in late summer. It usually recovers after light freeze. 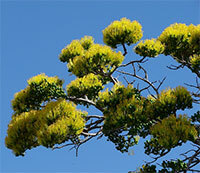 Very rare in cultivation, small to medium sized, dry deciduous tree, endemic of dry forests of Madagascar. 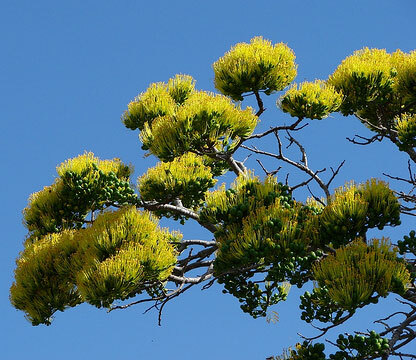 It has a thick, swollen trunk reminiscent of a Baobab, a rounded crown and dense tufts of curious greenish yellow flowers. Very large flat heads of yellow flowers appear in late spring. The tree is grown as a showy ornamental in rich soil in a subtropical to tropical climate. It can be propagated from seed. Apostle Plant. Iris with white flowers. 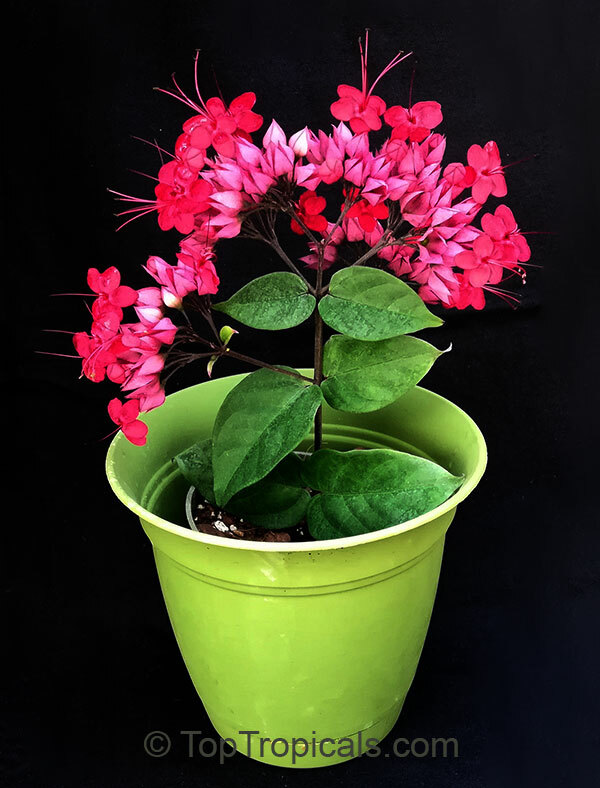 Plants mature to flowering size from seed in less than a year. The common name, Apostle Plant, comes from the belief that a Neomarica will not bloom until the plant has 12 leaves. Cold hardy only to about 30F. This new variety has flowers with fresh pleasant fragrance. Tropical Hydrangea. Off-white to pinkish showy flowers in bunches during winter and spring. The large leaves are hairy, with shallow, maple-like lobes. Tolerant to both light frost and periods of drought. An evergreen large shrub 6 to 12 feet tall that blooms over a long period from spring to fall with bright pink clusters of flowers. Plant in full sun to part shade and irrigate occasionally. Hardy to 20-25F. The plant has compact growth habit, similar to D. Seminole. One of the showiest landscape plants! 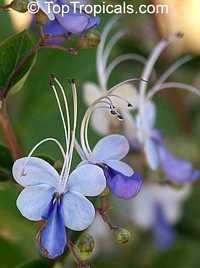 It is a real showstopper, and a bonus of this already great shrub is that it will also do well in a container. And a happy surprise - it also serves as nectar plant to a large number of butterflies. 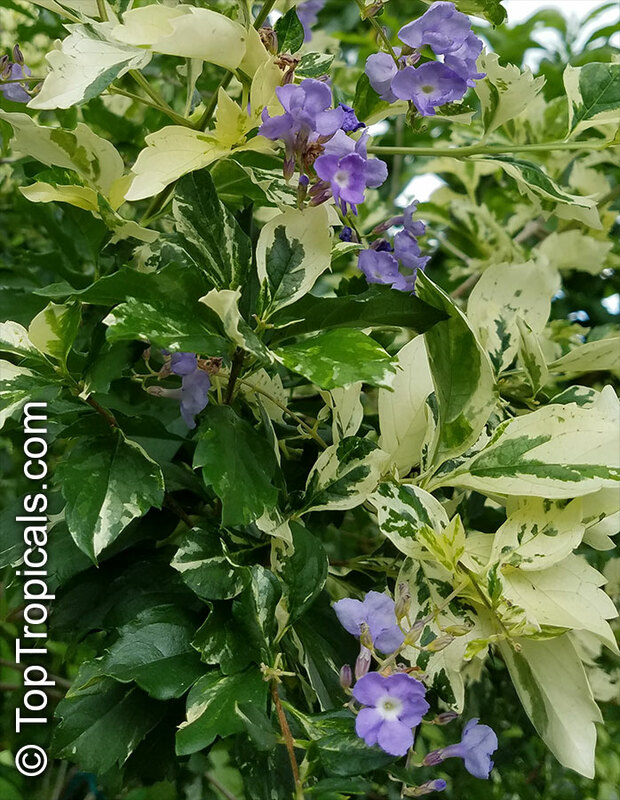 This winter bloomer puts on one of the best flower shows of any shrub here in Florida. It is sometimes called the tropical hydrangea because its flowers are similar to the hydrangeas we know from up North. The flowers are pink to rose color and bloom from fall to spring. That means it's blooming all winter in Naples during season, when the most color is desired and appreciated. Dombeya Seminole is a large shrub that grows 7 feet tall and about the same in width. It can be kept to about 5 feet tall with pruning. 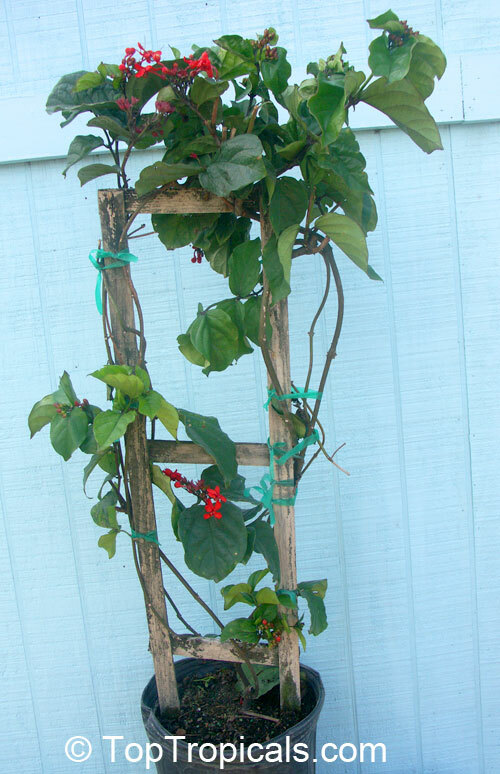 This shrub will grow in full sun to partial shade and will tolerate poor soil. 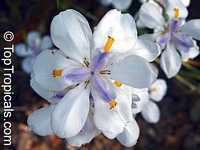 The more sun, the fuller the shrub, and that also encourages the maximum number of flowers. 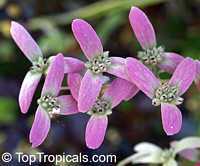 It is also fairly drought-tolerant once established. 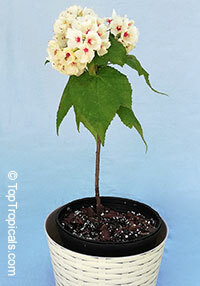 Tropical Hydrangea - very fast growing winter bloomer with fragrant pink hydrangea-like flowers. 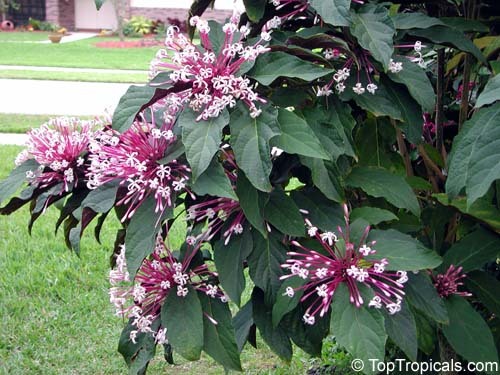 Large size multistem bush with large heart-shape lush foliage. 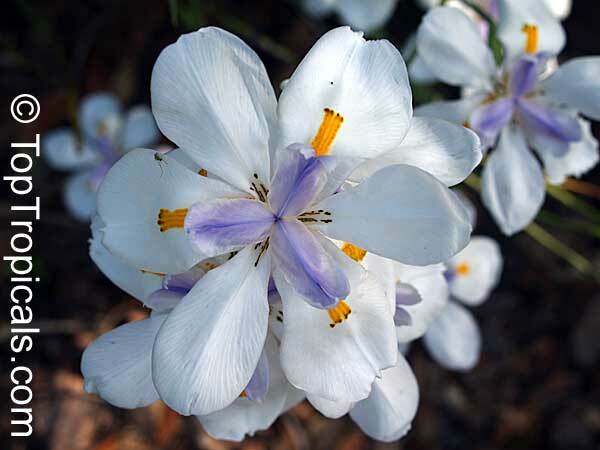 Flowers of this spectacular winter bloomer attract lots of bees and butterflies. Great landscape solution for a quick covering / screening of unwanted views! 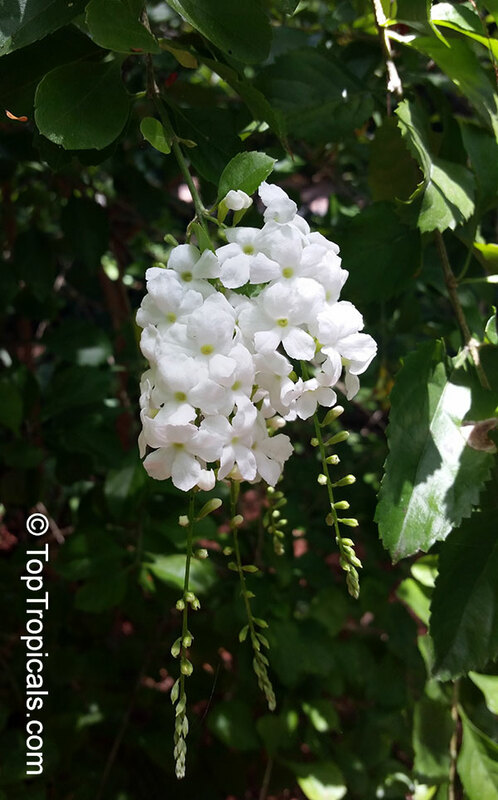 Duranta repens - Golden Dewdrop. The popular name of this large erect shrub is inspired by the clusters of bright orange-yellow berries that follow the flowers, in such quantities that they often cause the slender branches to droop gracefully. 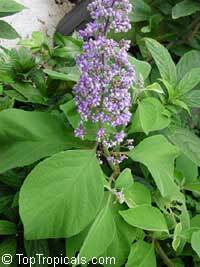 The lavender-blue or white flowers appear in loose clusters, and both berries and blossoms are often seen on a plant. This evergreen fast growing shrub spreads and arches to 10 feet tall and wide and is great for live hedges and covering fences and corners. Duranta repens - White Golden Dewdrop. The popular name of this large erect shrub is inspired by the clusters of bright orange-yellow berries that follow the flowers, in such quantities that they often cause the slender branches to droop gracefully. The white flowers appear in loose clusters, and both berries and blossoms are often seen on a plant. This evergreen fast growing shrub spreads and arches to 10 feet tall and wide and is great for live hedges and covering fences and corners. 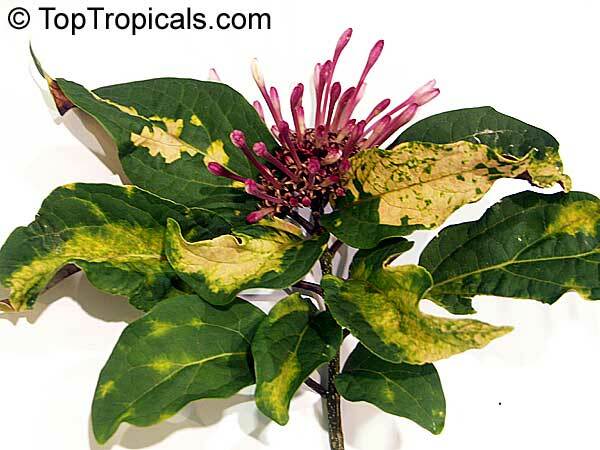 Variegated Sky Flower is grown for its summer flowers and ornamental fruit. This evergreen fast growing shrub spreads and arches to 10 feet tall and wide and is great for live hedges and covering fences and corners. In the summer, cascading clusters of blue tubular flowers appear followed by wonderfully contrasting orange-yellow berries. 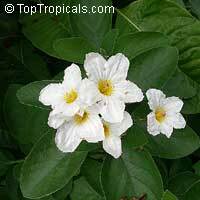 This variegated form has creamy-yellow margins around the one inch long serrated leaves. 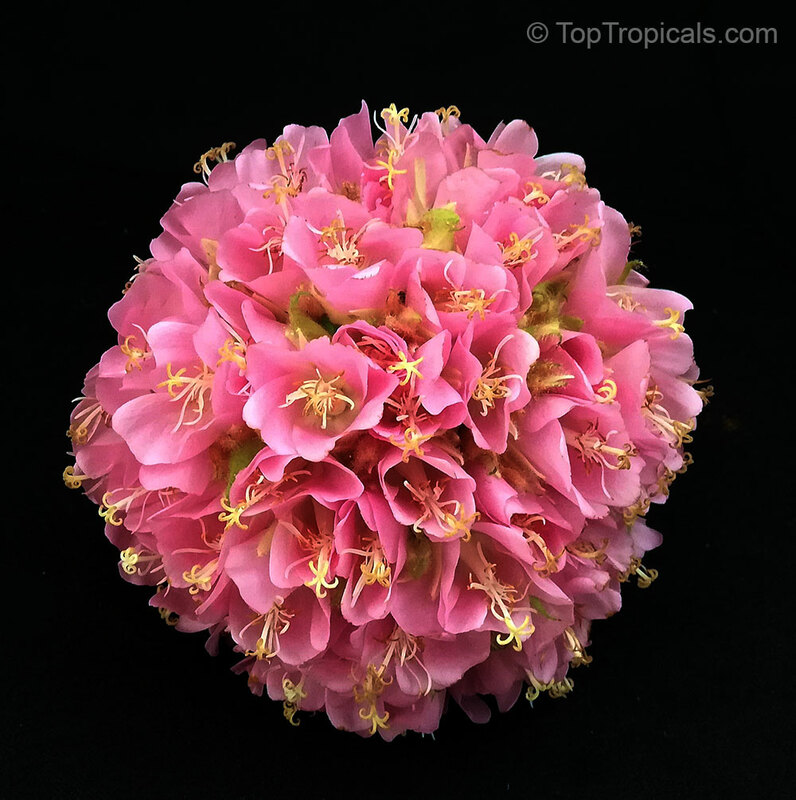 In mild climates this plant can be in flower nearly year round with flowers and fruit appearing at the same time. 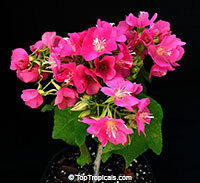 It does best in full sun with frequent deep watering and is hardy to about 20-25F. A good choice for espaliers, as a small tree or large bush; all forms benefit from frequent selective pruning. Flowers are very attractive to butterflies. Great for providing a color contrast in the landscape, and is especially well-suited as a bright-colored background or screening. Prune back in late-winter to encourage a more compact shape and strong flush of fresh spring foliage. Requires moderate watering in a well-drained soil. Elaeocarpus decipiens (Japanese Blueberry) is a large evergreen shrub with glossy green foliage easily trimmed into a tree form. It's an excellent privacy screen choice. Showy fragrant blooms from summer to fall are followed by black berries in late fall-winter. Very ornamental effect from older leaves, which turn bright red. Tolerant of poor soils and desert sun and heat.